The JOBS Act, which became law on April 5, 2012, included for the first time in the U.S., a legal structure that will permit the use of general solicitation in connection with small, non-registered investment offerings in the context of crowdfunding. The SEC still needs to adopt implementing regulations before this funding vehicle becomes available and the market decides if it is viable. This will take several months, if not a year. In the meantime, and even after investment crowdfunding becomes available, regular, non-investment crowdfunding may be a viable alternative for your enterprise. 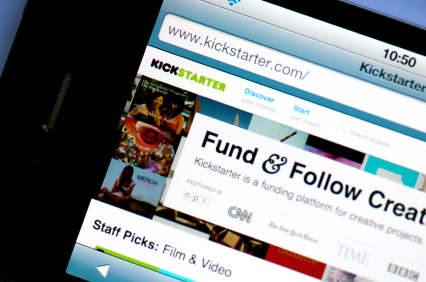 The crowdfunding concept began with the arts. Over the past few years, several crowdfunding sites have become well established, including Kickstarter, RocketHub and Indiegogo. These sites have been used by numerous artists to fund visual art projects, independent films, sound recordings and similar projects. The artist posts a description of the project and a request for a specified amount of donations. In return for the donation, a "reward" is typically awarded, often increasingly exotic as individual donations get larger. A typical example of a basic crowdfunding reward would be that a recording artist offers a free copy of the CD once it is produced, in a sense, resulting in a pre-sale of the CD. You should spend some time on the crowdfunding sites to get a sense of the culture that has developed on the sites, and the creativity involved in structuring a fundraising campaign. Over time, the crowdfunding sites evolved to include not only campaigns for artistic endeavors, but also campaigns relating to community improvement projects and charitable projects, often of a personal nature. Within the last 18 months or so, the crowdfunding sites have begun to also host some entrepreneurial fundraising campaigns for businesses. The business campaigns that have had the most success involved what is essentially a product pre-sale. For example, in March 2012, Double Fine raised more than $3 million to fund the development of Adventure, a new computer game, in return for a promise to deliver a copy of the game to backers once the game is ready to go to market. In May, 2012, the developers of the Pebble, an e-paper watch for iphones and Android phones, raised over $10 million from 68,929 backers in return for a promise to deliver a watch to the backers when the watch becomes available in the fall. We believe that non-investment crowdfunding is most likely to be successful for two types of businesses. One is a business that is developing a new consumer product that will have caché with certain types of consumers, such as early tech product adapters and gamers. The second is a business that has a natural affinity group of people who want to support the business. This second type of business is not likely to raise the astounding amounts of money described above. But organic farmers, health food stores, yoga studios, local bookstores, local restaurants, and similar businesses that have a constituency who want the business to succeed or grow, may all have some success raising money on a non-investment crowdfunding site. What legal issues does non-investment crowdfunding raise for a business? Crowdfunding can be very beneficial for a business because the money raised is non-dilutive to the owners and the securities laws do not apply. It is still important, however, to be completely truthful in telling your story, and meet the commitments you make to your donors. You need to be sure to properly protect your intellectual property. And you need to be sure your business is properly organized and operated, as you would for any business, so that you can use the money raised for productive purposes, and not for cleaning up problems or litigation. That said, we encourage you to consider whether non-investment crowdfunding may be a good alternative for your business.